Wilstead Circular Walk at Wilstead Walking RouteA five mile circular walk along the footpaths and bridleways around the village. The walk includes paths on top of the escarpment which provide superb panoramic views to the north. Start Point: The walk starts in the centre of the village and is a circular walk. 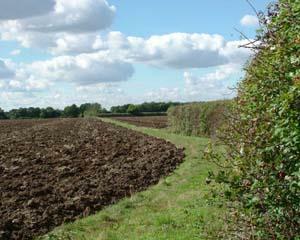 A five mile circular walk along the footpaths and bridleways around the village. The walk includes paths on top of the escarpment which provide superb panoramic views to the north. How to get there by car/parking: There is a good off road parking available in the village car park in Whitworth Way, behind the Methodist Church in Cotton End Road, (see map). If you are joining the walk other than at the start and are parking elsewhere please note some of the main roads in the village can be used for parking but some are narrow and unsuitable. The lanes are even narrower and should not be used for parking.